It was our last Saturday night in Jakarta. Everything must come to an end. 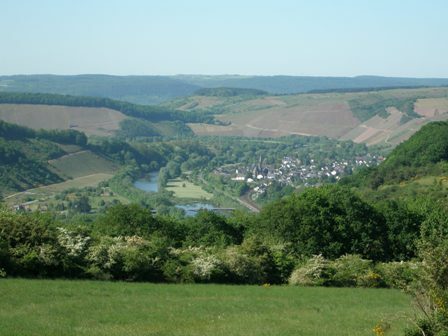 After 10 years, leaving was not an easy thing. A quiet “last supper” with our friends Liz and Walter was our preferred choice. 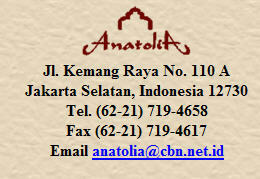 They invited us to Anatolia, a Turkish restaurant in South Jakarta. 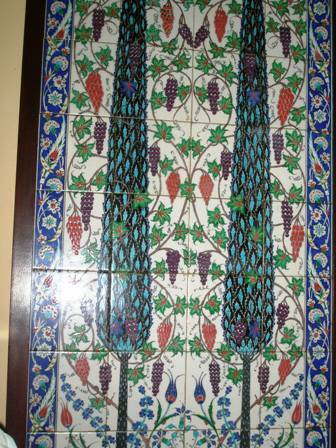 Beautiful tiles depicting among others “grapes”. 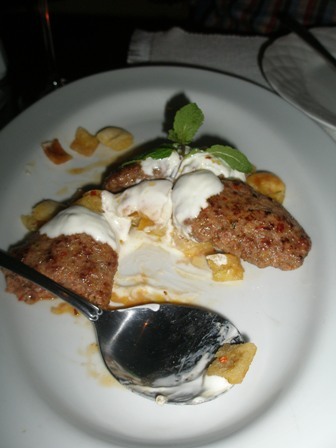 I am a lover of Turkish food and so it came as no surprise that we just loved the various dishes which were put in front of us. 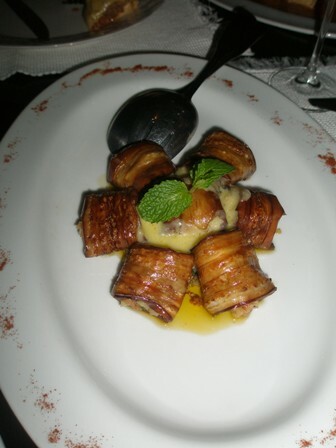 Good food, good company, good conversations, fun and good wine, that should become the recipe of the evening. And look at some of the food! 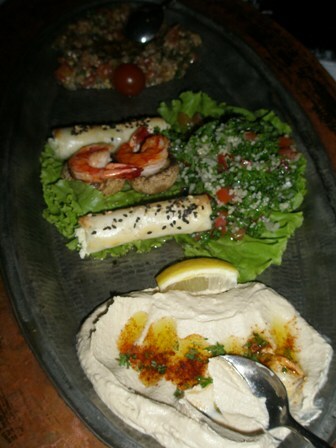 Unfortunately, I forgot most of the names of the different dishes. The atmosphere in the restaurant was lively. We were entertained by a dancer and modern music from the Middle East. What did we drink? As so often before, I was given the task of selecting the wine. I could have chosen some Australian reds but could not resist to order something new, something I had never heard of: a Turkish wine. Have you ever heard about Yakut (not not the thin Japanese milk-yoghurt drink, which is written with an l before the t)? 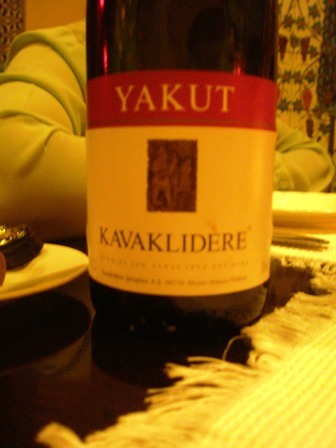 ‘Yakut Kavaklidere’ was written on the bottle. Fortunately the back label was in Turkish. I just could not resist ordering the bottle and some more were to follow. The wine was dark red in colour. 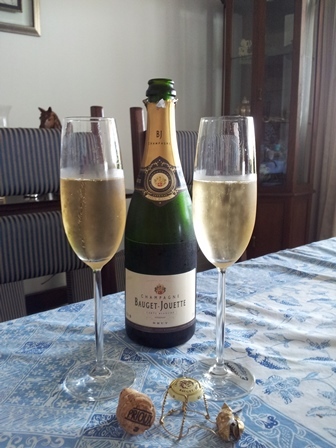 We were all surprised by its round taste, an intense fruit flavour, a bit of plum and cherries. But it was unlike other wines. I could not identify the grape variety. We all agreed that the wine matched the food very well. Existing prejudices about Turkish wines were quickly transformed into admiration. Despite the fact that this wine was simple (and not expensive) and not at all sophisticated, we just loved it. Thanks Liz and Walter for the wonderful evening. Are you living in Jakarta and having no plans for Friday night as yet? The choice is clear. 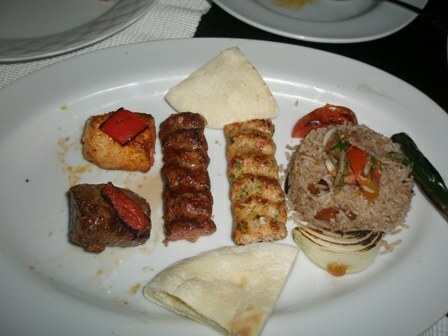 Have a meal at Anatolia. This entry was posted on Wednesday, September 24th, 2008 at 11:08 pm and is filed under food and wine. You can follow any responses to this entry through the RSS 2.0 feed. You can leave a response, or trackback from your own site. You have enjoyed your supper with wine in the middle east restaurant even in the ramadaan season which profibit to drink alchol. Didn’t you feel uneasy any time FPI will come and terrify to pay ? many thanks for your response. The weekend I refer to was the last weekend in August, a day before the start of the fasting month. The dinner would have happend after the break of the fast anyway. However, also as a non-muslimI should have the possibility to follow my own ways. And since Indonesia has a large minority of non-Muslim, they have to be accomodated as citizens as well. By the way, the prohibition of the consumption of alcoholic drinks applies to all Muslims also outside the fasting month. As regards FPI and their action, I consider their often violent behaviour as unlawful and againts the constitution of the Republic of Indonesia as well as againts other public and criminal laws. If I am not mistaken some parts of the German community frequent a place called “Die Stube” in Kemang. There should be other suitable places, maybe at the Aryadutha Hotel. Check it our yourself. Now that Id ul Fitri is approaching, peace, joy and happines are in the air. Oh and on another note, I thought pub was an English thing? German and Pub in one sentence??? That’s an insult to both culture!…just kidding.